Don't worry. This is NOT another... Woe is me, I can't cope because you are a No Reply blogger... post. In fact, it's nothing to do with being a No Reply blogger. I'm just curious as to how you check for replies to comments you've left on other people's blogs and am showing you the options open to you, as regards replying to comments left on your own blog. A comment left under my comment on the original blog post. Now, I'm not very good at going back to check to see if each blogger has left a reply to my comment. There are two reasons for this: I forget and lack of time. If I remembered to go back and check, how often would I need to check before (and if) a reply was left... daily, weekly? Everyone blogs with different frequencies. Yes, I know I could subscribe by email to that post. Here's what that looks like on my blog. Sometimes you can subscribe to just replies to the comment you've left, but more often than not, you are subscribing to every reply that's left and will therefore get an email for every reply, not just the blog owner's reply. There are occasions when I do want to read every comment left by every person who leaves a comment, but it's not usually on a sewing blog. It's usually on a blog where the comments become an extension of the blog post and there are a lot of opinions and different points of view given on the particular topic. On most craft / sewing blogs, I'm interested in the reply of the person who wrote the post. This, of course, is totally dependent on the topic of the post. If I have asked a question, if there is a particular reason I absolutely have to hear the reply or if I know the blogger well and know they'll reply to me via a reply comment on their blog, I will subscribe. However, in the majority of cases, I don't subscribe to receive replies via email. This means I miss out on reading many replies that are written as reply comments to me, on the blog post owner's blog. My preference, is for bloggers to reply to my comments via email. Easy as (for me)... an email is delivered to my in box. This can sometimes lead to an exchange of emails, that most probably wouldn't occur with comments left on a blog. Now, I am NOT telling you that you have to reply to comments left on your blog, via email, nor am I telling you it's the best way to go. It's your blog and it's up to you to choose how and if you wish to reply. I'm just telling you my experiences and showing you how to change your settings, if that's what you decide to do. When I first began blogging, I didn't want anyone to know my email address. I was concerned about the influx of emails I might receive... from who knows who and what might these emails contain. I was also aware that people online are not necessarily who they say they are and therefore concerned about my privacy. And so, I replied to comments with a comment underneath, hoping these people would come back and read my replies. Who knows if they ever did. It didn't take me long to get myself an email address, specifically for my blog and secondly, to alter my blog settings so I could reply to commenters via email. Were my concerns unfounded? We teach kids about Stranger Danger... the same applies online. There is most definitely an unsavoury element online and we need to take care with how much information we give out. There is also a wonderful, friendly and helpful community within the online sewing / crafting fraternity. Do you receive an email every time someone leaves a comment on your blog? If you do, you are all set up to reply via email, if you so wish. You can choose to reply via email, or you can still reply via commenting. You'll now receive an email every time someone comments on your blog and you can easily reply to them via email, if you want. 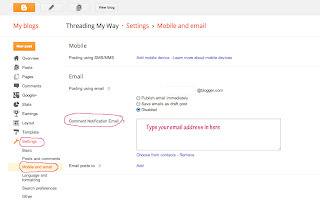 By enabling this setting on your blog, you are not showing anyone your email address. Lovely Person comments on your blog and Blogger sends it to you. Blogger is the go between. If you reply to Lovely Person via email, they can, of course, then see your email address, because it will go directly to Lovely Person and not via Blogger. Whether your email address can be seen by the blog owner, when you leave a comment on another person's blog, is dependent on a different setting and is not covered in this post. (But I am happy to do another post if you'd like. It's all connected with being a No Reply blogger or not.) This post only covers comments left on your blog. If you don't want to receive an email every time someone comments on your blog, just leave the Comment Notifications Email blank. I have heard people say that receiving notifications clutters up their email. I add a rule to my email program, so that all of the comments left on my blog, are delivered to the one mailbox. It's a little hard to see, but if you click on the picture below, you'll see a folder with 16 unread blog comments. It's not hard to set up. If you'd like to know how, leave me a comment and I'll write a separate post. This one's already a bit wordy. If you tentatively decide to turn on Comment Notification Email, you could, if you wished, reply to just some of the comments via email. Obviously you wouldn't reply to spammy comments this way. You'd delete them and delete the spammy comment on your blog. Most of them are No Reply bloggers anyway. You could, however, reply to me via email, when I leave a comment on your blog, if you just wanted to try it out. BUT, you can only reply via email, IF the person who commented isn't a No Reply blogger and that's a topic for another post. Although, I'm not sure if the Internet needs another No Reply blogger post. Much as I prefer to receive my replies via email, don't let anyone pressure you into sending replies via email if you have concerns, or if you are not comfortable doing so. I've been lucky and have never had any negative comments left on my blog, nor have I had comments left by less than desirable people; not that I'm aware of (other than harmless, if annoying spammy comments which I delete and then ignore.) I also give out very little personal information about me and next to none about my family, either via blog posts or email. If I were to inadvertently send an email to a questionable person, all they would have is my email address, which I could easily change if I needed to. As an adult, you need to make informed choices and choose the level of privacy that you are comfortable with. If you are a child or teenager with a blog, then I think any replies should be on your blog and not via email, all of course under your parent's supervision. In leaving a reply, however, please remember that everyone is entitled to their opinion and that each person is entitled to set up their blog in the way that suits them. 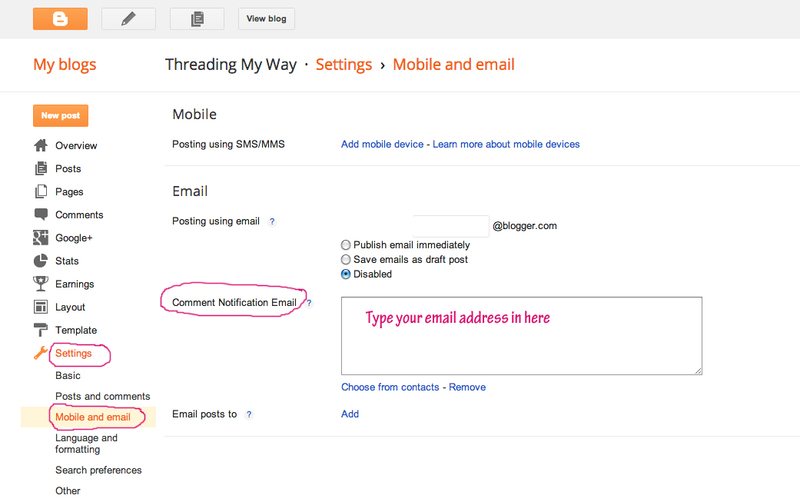 This is the latest post in the Blogging Tips series, here on Threading My Way. I originally had my blog set up where ANYONE could post to it and didn't have to have a blogger account. I then got a couple of strange posts that concerned me so I put a stricter setting on my blog. I have my account set up where I get an email, but most times when I comment on other blogs, I have to go back to check to see if they reply or not. I definitely prefer to get an email answer to any comment I've left on someone else's blog. It feels more personal. It would be difficult to go back into every blog I commented on looking for replies - there are just too many of them! I always reply by email..that way I don't forget anyone. It's easier forme too. I never subscribe to comments, sometimes you'll get several comments a day for months u til you unsubscribe. There a a ton of bloggers who only reply on their blog. I bet they miss out on a ton of interaction! I rarely go back to check on a blog comment unless I've asked a specific question or the topic is of particular interest...but I respect the bloggers choice to do so. I prefer email as it can lead to a nice back and forth conversation. I agree that it's up to each blogger how they want to reply, but perhaps it might be worth pointing out that they're wasting their time replying on their own blog. I never, ever go back to see if they've replied to a comment. There aren't enough hours in the day to keep up with all the blogs I like to read without having to visit each post 2 or 3 times to see if they've replied! I've accidentally ticked the box to get notifications when someone replies, and some blogs do it automatically, that winds me up! I personally think replying on your own blog is a bit egotistical. I recently read a post where the blogger says she doesn't reply to comments and she doesn't comment on other peoples' blogs as she feels she's doing her part by writing posts. I didn't even leave a flabbergasted comment, I just unsubscribed! When we first started we replied on the blog, but after awhile I got the impression we were probably just talking to ourselves- for the reasons you've mentioned. I do occasionally subscribe to follow up comments on other blogs, but it is such a pain because of the giant influx of email. I had one terrible experience with a blogger who clearly didn't regulate their spam comments. I unsubscribed to every list I could and still months later I was getting notifications of their spam comments. I still find them in MY spam folder a year later! The only downfall of email response is I've been on other blogs and been frustrated because I really wanted to know the answers to questions others had left too! Hi Pam, I totally agree with you. I like to get my replies in my email box. I wish that blogger would come up with a widget that would email the authors reply like Wordpress does. In the meantime on posts where the comments add to the conversation I reply to the comment on my blog and then when blogger sends me a notification I forward that email to the person who left the comment. It takes only a moment more to do and that way other readers can see my reply and the person who left the comment get an email response. I am glad to see someone address this topic. This post was so helpful. I thought replying sent them an email. Now I know that I must email them a reply. Thanks. Thank you very much for writing this post. I'm relatively new to blogging and until very recently - when a couple of other bloggers replied to my comments by e-mail - I hadn't realised it was possible to reply by e-mail. I much preferred that approach, as you say it's hard to always check back, so I've just googled how to set it up and found your blog. And even more perfect that yours is a sewing blog too! I'm off to have a browse through your tutorials now! Thanks again. Hello! Thanks for the info! :) I receive my comment notifications right to my inbox via blogger. I respond to each and every comment by hitting the ''reply'' button directly under they're comment on on my blog (not via reply in the e-mail). Do they receive a notification as well that I responded to them? I'm just curious. If you reply via the comments, like I'm doing now, the person who commented won't get an email with your reply, unless they tick the Notify me. If they tick the Notify me box, they can choose to be notified of follow up comments and then they'll receive your reply, plus further comments by other readers. I think that receiving a response via email is a great thing to do especially if the commenter has a question that needs an insightful answer. Great tips you have here. Thanks for sharing! I wish blogger had a way we could ask the commenter to leave an email address. Many times I'd like to respond back to that person individually through email, but I don't have access to an email. I've been doing some searching to try work out if people receive replies automatically on Blogger, but your post confirms what I was thinking! I will definitely be replying by email from now on - especially since my blog is so new that people won't automatically be coming back and seeing if I've responded to them! Do you think sending an email of the reply is weird? I'm torn which way I prefer because when I read comments on other blogs and the blogger commented back I can find that really nice and interesting but I also never go back after commenting to see if they responded so I doubt they do on my blog so sending an email would make sense.